Billy Crystal's one-man show 700 Sundays played 163 shows on Broadway in 2004 and won a Tony for Best Special Theatrical Event. And a special theatrical event it is! He has revised the show and is bringing it back to Broadway this fall, but first, he's doing six shows right here in Minneapolis at the State Theatre. I was lucky enough to attend the opening night performance and I was truly blown away and surprised at what I saw. I was expecting a comedy routine, which coming from Billy Crystal (star of such hit movies as City Slickers, When Harry Met Sally, and my favorite, The Princess Bride) would be enough. But 700 Sundays is so much more than just a stand-up comedy routine. It's a living memoir of a life that is in some ways extraordinary (hosting the Oscars), but more importantly is a completely relatable and universal story of family, home, grief, hope, and laughter. Speaking fast and with great physical energy, Billy doesn't just tell stories, he acts them out and impersonates everyone from his crazy relatives to famous jazz musicians. These stories are accompanied by photos and videos that his father shot, displayed on the windows of the facade of Billy's childhood home that has been reproduced on the stage. This setting and the vintage photos and videos immeasurably add to the experience because you can see these people while Billy is describing them, almost like they're there on stage with him. His stories about growing up in Long Beach, Long Island are classic Americana from the 50s - involving shiny new cars, local mobsters, the magical allure of baseball, crazy relatives (his impersonation of his Grandpa and the noises he made had me in tears! ), and the height of American jazz (his uncle started the independent record label Commodore Records and his dad ran the record store and produced jazz concerts on the Lower East Side of Manhattan). There's great nostalgia in Billy's stories and performance, and the evening takes a turn when he talks about his father's sudden death from a heart attack when Billy, the youngest of three sons, was just 15 years old (the title refers to the approximate number of Sundays he spent with his father). He looked in the mirror after his mother gave him the news and "didn't see a kid anymore." He eloquently describes his experience with grief as a feeling of "otherness" and carrying a boulder with him everywhere he goes. But with help from the strength of his mother he persevered, earned a baseball scholarship to college, fell in love at 18 with the woman who has been his wife for 43 years, and became the Billy Crystal we all know and love. Through it all family and home has been the most important thing to him and has grounded him and allowed him to accomplish everything he has. He says that none of his success is possible without someone to say "I believe in you," and though the hand he was dealt included great tragedy, it also included many wonderful things, so in the end, he's happy with it. 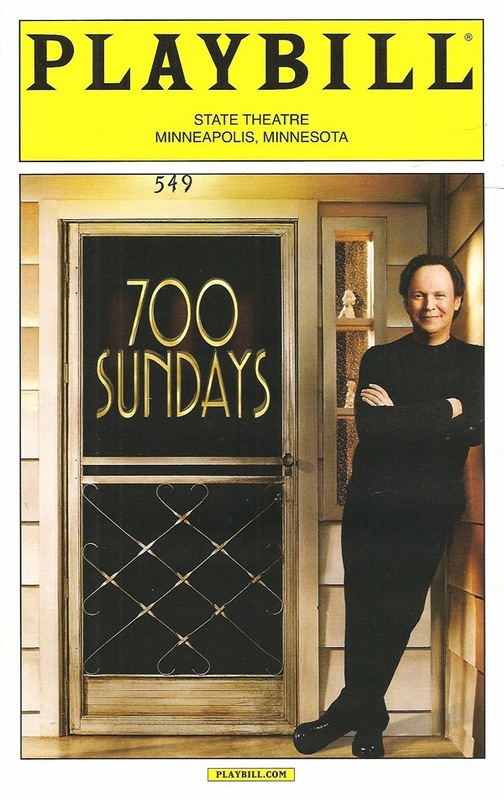 700 Sundays is an incredibly moving and inspiring story of a life, in addition to being hysterically funny at times!